Students generally exhibit a high level of interest in space related topics, yet teaching astronomy can be a challenge due to its abstract nature. A planetarium allows astronomical concepts to be demonstrated in a three dimensional environment that significantly aids spatial understanding. The planetarium setting is not only educationally effective but also awe-inspiring, increasing student enjoyment of and interest in science. Think of the possibilities of having your own easy to use planetarium at your disposal. No more headaches organizing a field trip to an off site planetarium. Use your projection system as often as you need to cover your subject matter fully, and tailor your lessons to your students' interests and questions. Label and zoom in on any object in the sky for easy identification. Show annual motion (including retrograde motion), precession, and proper motion. Simulate the sky from any point on Earth, other planets and moons, asteroids and comets, or objects you define. Display constellations from many cultures. 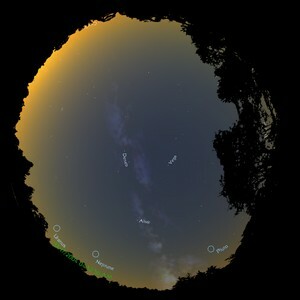 Simulate celestial phenomena such as transits, eclipses, and meteor showers. Project numerous reference points, lines, and grids. Display your own images or videos, including full dome movies. Create your own prerecorded segments or shows, including image manipulation, video, and audio. Digitarium systems are available in portable or fixed configurations. A portable system can easily be set up at any school using a Digitalis inflatable dome; set up or take down of a Digitarium system and Digitalis dome takes about 15 minutes for one person. We offer systems for fixed domes up to approximately 60 ft/18m in diameter. We believe Digitarium systems are the best value on the market for astronomy education. Although more expensive than most portable pinhole projectors, our systems are a huge value proposition, as you get the features of modern digital planetariums at a small fraction of the typical cost. With full sky projection coverage, fast setup and take down, and the outstanding usability of our unique handheld remote control, our systems stand out from other digital systems on the market. Just wanted to let you know that we received the projector last week and had it up and running literally within 10 minutes of getting it unpacked. It is a wonderful machine. All of the astro faculty here are very pleased with the purchase and are already coming up with lots of ideas of how to use it in their classes! Q:Is there a warranty for your products?